If the proof owner has allowed it, you will be able to download the original file of the proof, then print it as you like. Click the download icon on proof tile on the dashboard. 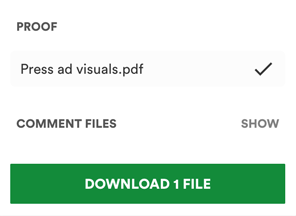 Click the download icon when you are viewing a proof. Click download 1 file. Once the file has been downloaded, open the file and print.